This all-in-one preamp/effects processor stunningly recreates great guitar signal chains - stompboxes, amps, cabs, mics, studio effects, and more - with unprecedented power, flexibility and control. As the successor to what many believe to be some of the best-sounding processors ever created, our new arrival takes "real amp tone and feel" to the next level, offering the latest word in our commentary on restoring digital to its rightful place as the superior solution for guitar processing. Never willing to rest on our laurels, we are proud to present the Axe-Fx II. Our philosophy is to never cut corners on processing power.Our new state-of-the-art algorithms required a powerful platform on which to operate, so the Axe-Fx II features two (count 'em) 600 MHz dual-core Analog Devices TigerSHARC Digital Signal Processors working in tandem. One processor is devoted solely to amp modeling while the other handles effects processing and system tasks. An ultra-high-speed bus interconnects the two processors, shuttling data back and forth. Mated to the processors is a high-speed, 64-bit external memory bus and twice the RAM of previous Axe-Fx products. A 200K gate FPGA provides peripheral functionality and system bus management. The Axe-Fx II is by far the most powerful instrument processor ever created, with more raw, real-time audio processing horsepower than anything available at any price. Yet, unlike power-hungry PCs, the Axe-Fx II consumes less than 40W and is nearly silent in operation. All this power would be useless without state-of-the-art algorithms to go with it. Three years of research has yielded what we call G2 Amp Modeling Technology, comprised of major breakthroughs in both preamp and power amp modeling. First we created our new Virtual Vacuum Tubetechnology. VVTis a complete departure from the static waveshaping technology used by other products. It is a digital replica of a vacuum tube complete with time, frequency and level dependencies. Just like a real vacuum tube, our digital replica is truly dynamic and changes with your playing. This creates a level of realism, complexity and response that other products just can't match. Next we rewrote the book on power amp modeling. G2models the entirepower amp including the phase inverter, power tubes, output transformer, power transformer, choke, filter caps and more. The results are amazing: warm, yet tight bass, powerful midrange and silky highs. We even model speaker distortion and voice coil interaction. In addition, the amplifier block now includes an integrated 8-band graphic equalizer for additional tone shaping without extra blocks. The current lineup of Axe-Fx II amp models were created by incredibly detailed analysis of the actual amps that inspired them. We spent a small fortune searching out and purchasing vintage and modern amplifiers to add to our reference collection. Along with the new dynamic speaker modeling in the amp block, the Axe-Fx II features a new higher resolution (2048) convolution cabinet emulator with 64 factory Impulse Responses (IRs) and 50 'USER CAB' memory locations. Factory IRs also include selections from the Redwirez and Ownhammer collections, plus contributions from loudspeaker design engineer and Axe-Fx early adopter, Jay Mitchell. A new, custom-designed 160x80 backlit LCD provides improved readability and more comfortable screen layouts. In addition to the main VALUE knob, new QUICK CONTROL knobs are provided for hands-on access to four additional on-screen parameters. Eight block types - amp, chorus, drive, delay, flanger, phaser, pitch, and wahwah - are now equipped with two fully independent parameter sets called 'X' and 'Y'. The X/Y switching feature allows one block to have all of its settings switched at the touch of a button (during editing) or via MIDI remote control (during performance). The X and Y buttons also double as user-definable Quick-Jump keys, which can be set to open the EDIT menus of any 2 blocks without going through the grid. A built in FLASH ROM also now allow onboard backup/restore of preset banks and system settings. An Audio Class 2.0 compliant USB interface is provided for both audio streaming and remote control/communication. You can record the Axe-Fx II main outputs on your connected PC or Mac, and on USB 2.0 systems, simultaneously capture a 3rd 'dry' track for re-amping later. 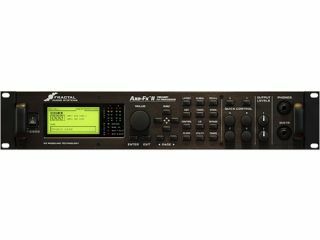 You can also monitor or process computer audio tracks with the Axe-Fx II, and high speed MIDI-over-USB eliminates the headaches of 3rd party legacy MIDI interfaces for remote control, backup and restore, or Axe-Edit sessions. All rear analog inputs are now balanced like the onboard XLR outputs. The 1/4-inch unbalanced outputs feature our new Humbuster technology, which senses and subtract the ground noise of equipment conected with a simple stereo-to-mono cable. This can provide up to 20 dB reduction in ground noise without resorting to dangerous 'cheater plugs' or expensive isolation transformers. The Axe-Fx II was also designed with the 'Four-Cable Method' in mind. Special analog processing keeps the noise floor even lower on output 2, designed to be connected to the front of an amplifier. The Axe-Fx II uses digitally controlled potentiometers to operate as a unity-gaindevice irrespective of the input trim controls. Simply set the input trims such that the input LEDs indicate optimum operation and you are done. Another benefit of this technique is that Amp and Drive blocks are unaffected by trim settings. In addition to its USB interface, the Axe-Fx II sports SPDIF and AES input and output connectors. 7-pin MIDI In and a selectable MIDI Out/Thru jack are provided for interconnection with other MIDI controllable equipment. The core amp/cab tone and hardware features are not the only areas to benefit from upgrades and improvements. The effect processing capabilities of the Axe-Fx II are also greatly enhanced in comparison to previous products. First, we've made it easier to dial in 'all time favorites' on the Chorus, Delay, Flanger, and Phaser, with a TYPE control that instantly makes all other required settings for great sound in seconds. These include tape delay models, analog 'bucket brigade' echo, chorus, and flanger, 'script' and 'block' logo phasers, 'vibe and many many more. The core sound processing capabilities of these effects has also been upgraded to provide extremely authentic representations of the specific characteristics of classic originals. Many of the effects and algorithms have been also been updated and enhanced. A dedicated 60-second looper block is now included. The Delay and Reverb blocks now feature many improvements including integrated parametric EQ. Chorus, Flanger and Wah-wah modeling has been improved and also now includes optional built-in nonlinearity 'circuit overdrive' simulations. Graphic Equalizers (including Global) are 10-band. Compressors now use ms values for attack and release times, tempo parameters now offer 64 different rhythmic values, filters operate at up to 24 dB slope, maximum global LFO and sequencer rates upped to 30 Hz, and more! Those familiar with 'Global Amps' from previous Axe-Fx products will appreciate a greatly improved new system which has also been expanded to every block type in the inventory. Those new to the Axe-Fx II will appreciate how global blocks allow centralized control of your preset collection. Save any 'normal' block to a separate and independent global memory area, then load this entry across multiple presets with a 'link' to keep it instantly and seamlessly synchronized to the master. You can update the master from any linked instace as desired, and should you choose to REMOVE a link, this leaves both the global and the normal entires fully intact and able to be edited independently of one another again. Whereas the Axe-Fx Standard and Ultra are …almost… mature in terms of their capacity for further development, the Axe-Fx II is well equipped for a future of free upgrades and updates in the tradition that established our commitment to product evolution. Join our mailing list for announcements about the availability of the Axe-Fx II. There will be NO reserve orders! The product will retail for $2199. Note: The Axe-Fx II will be available in the UK and Europe through G66 priced at EUR 2299 including VAT. Shipping to the UK is free of charge. Sign-up for the waiting list via their website.